Explore aspects of Upper Nidderdale’s past through these ten objects. You can find all of these objects, and lots more, at Nidderdale Museum in Pateley Bridge. This brooch is representative of the local interest in bellringing and its history throughout Nidderdale, especially in relation to the Middlesmoor Bell Festival. Early in 1868 Thomas Jackson, a young carpenter who lived in Lofthouse, found a number of silver coins at How Stean Gorge. This polished granite curling stone is one of a set of four stones originally used by the Pateley Bridge Curling Club. The River Nidd provided power for mills and industries, but it has also offered leisure, sport and nourishment. Galena is a grey mineral and the chief source of lead. This piece comes from the moorland of limestone and sandstone around Greenhow village. The wet climate in the upper dale meant that the only cereal crop which could ripen satisfactorily was oats, forming the staple diet of many people. Wooden pew from the former Wesleyan chapel at Lodge, a small settlement abandoned when Scar House Reservoir was constructed. A product of decayed vegetation found in boggy moorland, peat was the only fuel for many people in the dale. Stone has been extracted for centuries in Nidderdale where it has been of considerable economic importance. These objects were taken from Nidderdale Museum’s 40th Anniversary publication ‘Traces of Nidderdale in 40 Years and 40 Objects. 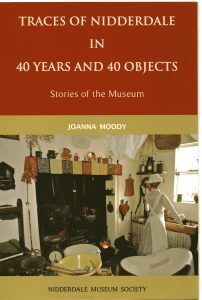 Stories of the Museum’ by Joanna Moody. Copies of the book are on sale in the museum at £12 (£15 including UK p&p). Contact the Museum on 01423 711225 for details. You can download a flyer here.